Day three of my road-trip to Uluru has been a break from driving. Pulled into Coober Pedy last night, for a two night stopover. Now I’m doing another late night backseat blog post on my android phone. This time the additional challenge is Jack Daniels – I’ve had a few bourbons to chase away the chill, so apologies for typos. I visited a few underground museums today, as well as other sights. I’ve been to Coober Pedy a few times on work trips, but it was nice to see the sights with friends today. After visiting a few tourist sites, I dropped them off for some noodling (i.e. to go through dirt mounds, looking for opals). Meanwhile, I visited the underground bookstore. Lots of shops are built underground here, and half of the 3,500 residents live underground. Australia produces 95% of the world’s opals, and where I am accounts for most of that. Opals are alluring, pretty and sometimes valuable. Its easy to get the fever; wanting to find that vein that will make all your dreams come true. Coober Pedy, the town, turns a hundred next year. The name of the town comes from the Aboriginal phrase ‘kupi peti’, meaning ‘white man in a hole’. How quick it must have been from amusement of seeing Europeans digging around for colourful rocks to feeling the gut wrenching impact of the destruction of their land. I can’t even imagine how that would feel for the traditional owners, who have lived here for tens of thousands of years. Which is why I don’t feel comfortable possessing opals. Eons before First Nations People walked this land, and even before mega fauna existed, this area lay under an ancient ocean. 120 million+ years ago this area was an inland sea, not the water-scarce desert it now is. In this ocean lived massive aquatic dinosaurs. I saw some of their fossils today. Sort of puts things into perspective when you see signs of life that old. Well, the day has come to an end. Tomorrow night I will make camp over the border, in Northern Territory. Before I turn in, I should explain the photo – it has nothing to do with Coober Pedy. I took this photo yesterday, at the Lake Hart look-out. This colourful van was pulling out as I got in, and I couldn’t resist the picture opportunity. Firstly, from envy. He’s set up looks more comfy than my backseat bed. 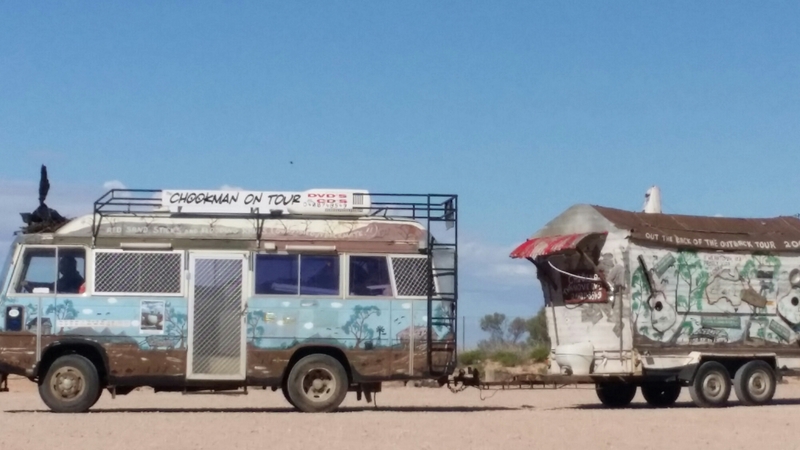 And secondly, because this is the type of quirkiness I love about travelling through outback Australia. I’ve since found out that he is a travelling iconic artist/musician. Google ‘Chookman on Tour’ to find out more. Now, bedtime for me as another day on the road awaits me tomorrow. PS I don’t think that was too bad for writing under the influence. Maybe a re-read in the morning will prove me wrong. At least I’ve warmed up! What a great adventure you’re on, Karen. I shall definitely follow your escapades as a road trip across Australia is definitely on my bucket list. Its now day 10 and I haven’t posted since day 3, due to lack of internet and electricity most days. Homeward bound now, so will write some travel blogs then. Its definitely worth putting up with cold nights – outback Australia in winter is beautiful. Hope you get to see it, Teagan. Writing under the influence of being down under, right? ;p Loved your post. Sounds like an amazing adventure. So, did you find any opals? I had to laugh because here in Texas “noodling” means “catching fish with your bare hands.” And no, I’ve never tried it! Anyway, I’m popping by from #wwwblogs on Twitter, where I am @TuiSnider . I RT’d ya, and wanted to make sure to comment, too. I sometimes get waaaay behind on that. My friends found a few pieces of potch (light coloured opals, which have no monetary value). I picked up a few pieces, not sure if I will take them home though. Thanks for the retweet and comment. lol, that was my youth.